BOAT BOOKS: How to find a logbook - Page 2 of details of our huge WORLDWIDE range of logbooks. LOGBOOK FOR CRUSING UNDER POWER. This logbook is specifically designed for the motor cruiser skipper as their requirements are vastly different to those of the cruising sailor. This logbook accomodates all the different requirements you may have when logging entries on a motor boat. Apart from the usual entries like weather, tides, courses, logs, engine hours and trip information it also contains a separate engine and fuel log as well as a services log, safety equipment, stores inventory and stowage plan. YACHT LOG. By Mystic Seaport Museum. Hardback, 0.71kg, 285mm x223mm, 142 pages. Published in 1983. This log opens with several pages for recording pertinent data about your vessel and following this are several pages for your guests to sign. The body of the log contains the pages to record your passage from one port to another. The left hand page has the important columns for you to note in quick fashion relevant facts of your vessel's operation and the environment. Apart from Time, Position, and Course there are columns for Person at the Helm, Current, Wind and Weather. Navigator's choice and Skipper's choice columns have been added to note specifics not necessarily relevant to all boats. At the bottom of the page is space to note maintenance and reminders and fuel and water taken on board. The right hand side of the page gives you the room to remark on the trip with comments and observations and note the engine or sail combinations used during the trip. At the bottom of the page you can note the persons on board.
. All this is packaged in a beautiful red-brown cover with "gold" lettering. THE MAINTENANCE LOG By Weems & Plath. Paperback, 0.32kg, 284mm x 220mm, 80 pages. 80 pages of critical maintenance information. RYA POWERBOAT SCHEME SYLLABUS & LOGBOOK By RYA. paperback, 0.11kg, 148mm x 210mm, 44 pages. This is the new edition of the RYA Powerboat Scheme syllabus & Logbook. This will enable you to to keep a record of your personal powerboating achievements and help you to plan your route from beginner all the way through to our Advanced levels. It details the structure and content of all courses within the RYA Powerboat Scheme and provides information on related shorebased courses. 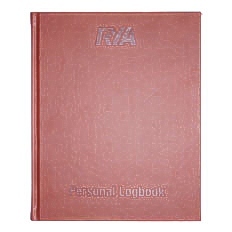 RYA PERSONAL LOGBOOK By Robert Dearn. Hardback, 0.6kg, 205mm x 250mm, 128 pages. Journal features leather cover and gold tipped page edges. 192 lined pages of archival quality, acid-freee paper. Bookbound. The leather_covered journal is stamped with an original ambigram, which reads the same right sided up or upside down. INLAND WATERWAYS LOGBOOK. Softback, 230 x 160mm, 96 pages, black and white illustrations. As well as daily log pages, the logbook includes sections on boat handling on waterways, and a simple map of UK waterways, with basic information on the navigable rivers and canals. By Adlard Coles Nautical, Handbook, 193mm X 252mm, 96 pages. This book is designed to be simple to use. A holiday cruise is meant to be a relaxing and highly enjoyable experience. Although it can be used as a normal logbook, the entries you find here are restricted to basic information. The columns are not cluttered with unnecessary detail. 63 page logbook covering a record of medical treatment given and the requirements for ship's medical chest plus medical inventory checklists. Flexi covered, 290mm x 220mm, 52 pages. The guest log is a visitors book for yachts, boats and other vessels. On the first page is room to put the vessel's particulars like, name, home port, owner and captain's name. There is even a special place to put a photo of the vessel. The second ,third and fourth pages have room for more extensive particulars like, draft, length, tank capacity, engines, propeller size, equipment identification and serial numbers etc. This is followed by 2 pages where you can log commonly used courses. Those pages are followed by another 5 pages of general information on Rules of the Road, radio procedures, distress signals, equipment checklist, weather reference and Flag etiquette. The last page before it goes on to the guest register proper, is a page where you can note "the rules obeserved aboard this vessel to keep her in top condition". All in all a very useful log to have if you entertain a lot of passengers on your vessel. Record book for each discharge operation or completed incineration. This includes discharges into the sea, to reception facilities or to other ships, as well as accidental loss of garbage. by MCA Softcover, 210mm x 298mm, 62 pages. International Convention for the control and management of ships' ballast water and sediment. All ships in international traffic are required to manage their ballast water and sediments to a certain standard, according to a ship-specific ballast water management plan. This record book is used on board all vessels to record intake and discharge of ballast water. Chief Officer's Log Book Clutha (No.16) 6 mths. Set up in a grid-table pattern for organized and efficient records. The logbook contains 200 pages of log entry space and, on each page, allots space for: Vessel Name, From, Towards, Courses, Error, Winds, Air/Sea Temperature, Current Set/Drift, Wheel & Look-out and more. Hardcover, 1.92kg, 370mm X 310mm, 384 pages. The Chief Engineer’s Logbook allows you to keep a daily record of the engine and auxiliary performance including running hours, temperatures and consumption. It also provides a comprehensive picture of the engine and auxiliary machinery for a precise day should this be needed for future reference or in the case of an incident. This log book's pages are numbered. by MCA. Softcover, 1.92kg, 295mm X 210mm, 72 pages. In order to assist Masters and Officers in maintaining the necessary records, the Maritime and Coastguard Agency (MCA) have updated the 'Radio Log Book' (GMDSS) and 'Simplified Fishing Vessel GMDSS Radio Log Book', and incorporated them into this single volume. For ease of use a 'delete as appropriate' and 'complete as required' system has been adopted, which allows this Log Book to be used as either publication, dependant on the user's specific requirements.